Here's the "little black dress" of chocolate fondues: basic, elegant, and adaptable. Whether you prefer the intensity of dark bittersweet or the slightly sweeter semisweet, choose a good-quality chocolate you would enjoy eating out of hand. Cognac is the classic flavoring, but dark rum, bourbon, Kahlua, Grand Marnier, or just about any liqueur works equally well. If you prefer to forgo the alcohol altogether, substitute an equal amount of one of the bottled syrups used for flavoring coffee drinks, or 1 teaspoon vanilla, almond, or orange extract. Pull out all the stops when it comes to dipping here. Offer a colorful assortment of fresh and dried fruits, keeping in mind that strawberries are usually the hands-down favorite. Also think marshmallows, sugar or nut cookies, donut holes, pretzels, small squares of waffle, frozen bits of cheesecake, and bite-size cubes of angel food or pound cake. In a medium saucepan, heat the cream and salt over low heat until hot but not boiling. Gradually stir in the chocolate, letting each addition melt before adding more. Stir in the cognac. 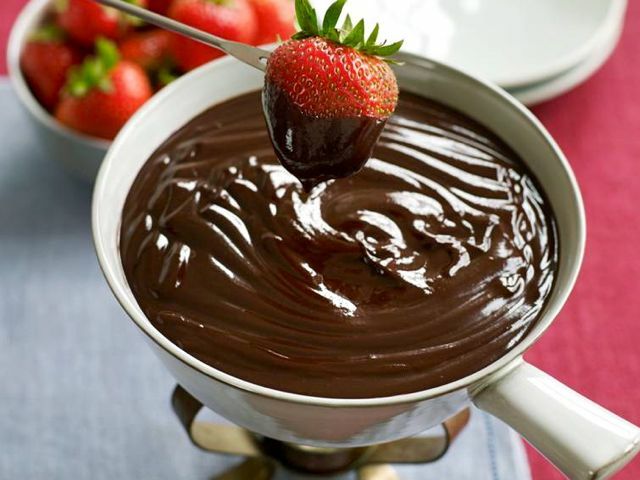 Transfer to a ceramic fondue pot and set over a low flame. Regulate the flame under the fondue to keep it as low as possible. If it begins to boil, turn off the heat.